Most of us don’t realize how easy it is for added sugars to sneak into our day. On average, Americans consume about 200 to 300 more calories per day than we did 30 years ago. About 46 percent of those calories are beverages. Companies that make those beverages use sophisticated marketing tools and tricks to get you to keep drinking sports drinks, sugary sodas, energy drinks, and other loaded liquids. Add in cool celebrity endorsers and extra-large portion sizes at rock-bottom prices — and you have a recipe for obesity, diabetes, and other diseases from an early age. So why is all this important? Well, it’s estimated that the average American consumed about 45 gallons of sugar each year — that’s equivalent to over 39 pounds of pure sugar! Even more shocking: Children are drinking more and more sugar, resulting in an increase in childhood obesity rates. For the first time, scientists have estimated that children today will be the first generation to have shorter lifespans than their parents. The biggest sugar culprit in the American diet is sugary drinks. For example, a 20-ounce soda has about 65 grams of sugar. Let’s put that into energy balance terms. It would take an average adult about 45 minutes of brisk walking to burn off those additional calories in a 20-ounce soda. If a child consumed a 12-ounce soda, it would take an estimated 30 minutes of vigorous bike riding to expend the energy. 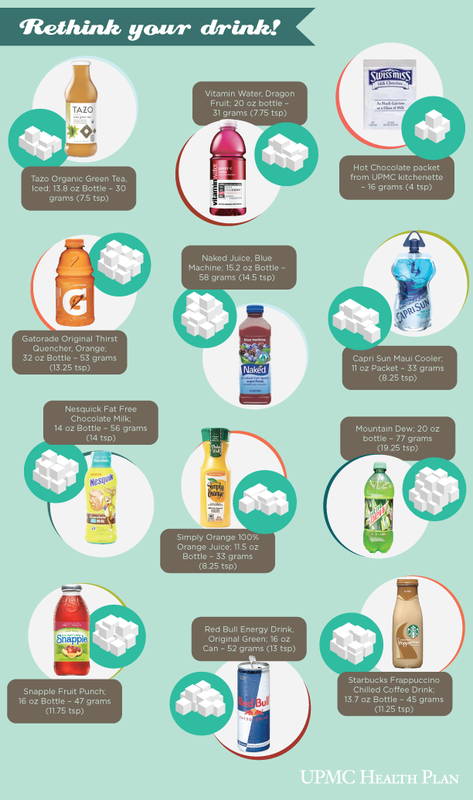 We’ve done a little research of our own, and I have to admit that I was a little shocked at some of the sugar content in the drinks below. So how can you keep your family healthy? Aim to drink more water and less sugary beverages. Be sure to look for our next post featuring a few recipes for your family to try. These drinks ditch the sugar and still taste delicious!